Your answer was very helpful for me. Earthshine Doll has good advice! My biggest struggle is my own impatience. 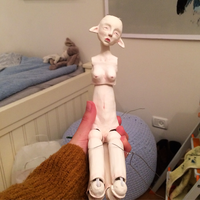 Nothing about making dolls is fast. 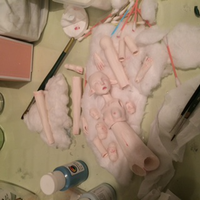 I also have another problem, the porcelain sticks to some of my molds, i wonder if the reason for that may be because the plaster wasn't completely dry from its inside? 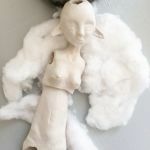 I casted all my porcelain parts and soon I will take them to be fired in a ceramic studio (I don't have a kiln at home). I also heard that porcelain can warp in the kiln, what dose it means? The first fire is usually around 750° celsius. Then you have to WET sand your pieces for a smooth finish. Use different sanding pads. Be careful the pieces are fragile! When all your pieces are completely dry, then comes the high fire at 1300° celsius. To avoid warping in the head, torso...fill them with kiln fiber. 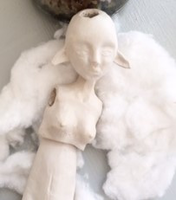 I fiered my porcelain bjd, the firing went preety good and now i have to do the china painting on my doll. I want to ask how are the water based china paints? All the stores near the area i'm living in, sells only water based china paints and i want to know if the water based paints are good as the oil based ones. Water based paints just mean you can use water based mediums. The medium fires out so there really is no difference in the finished look. I find them easier to work with because I can clean with water instead of turps or something. 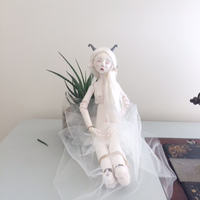 Faun is my first porcelain bjd, her life story: when she was young two horns had started to grow out of her head. From the age of 9 she started to perform at the Victorian Circus Freak Show as Faun- the horned girl and when she was 18 she ran away from the circus with Will, the circus's fire performer.